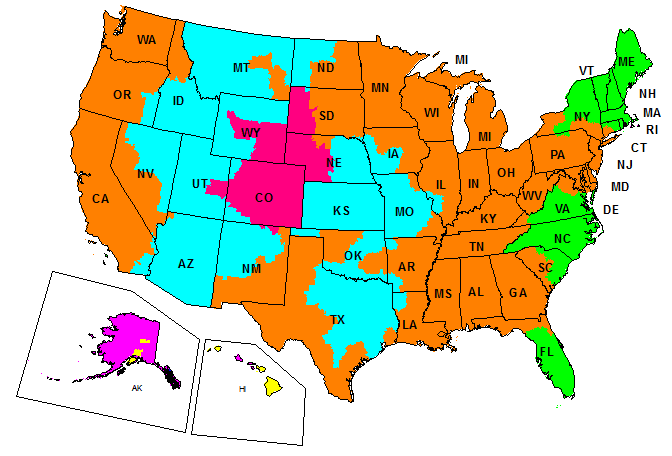 All that would be included here is what is shown in the picture. 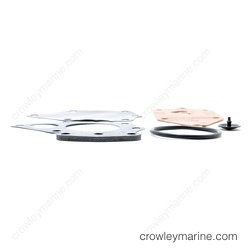 You would have to order the Filter Cap Screen (p/n 0312675) and the Fuel Inlet Cap (p/n 0335335) separately. Fuel pump rebuild kit is for SJ15RPW, yes ? This model is referred to as a "Commercial" motor. Hello, yes, this fuel pump rebuild kit will fit your engine. 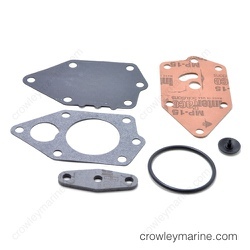 Will this kit work on 1998 E50TSLECC electric start Evinrude fuel pump? This kit is only for older style lift pumps. You motor has a VRO pump. 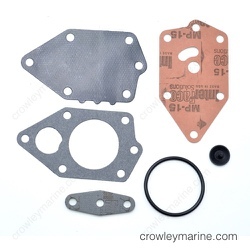 The repair kit part numbers for the VRO pump are 0435921 and 0436095 here: http://www.crowleymarine.com/parts/2295.cfm. My motor was hit on the trailer while stopped at a light. Rather involved repair. Lower unit, mid section, and power head needed to be removed. I rated this hard just because of the time involved. If you have experience in mechanical repair this isn’t too difficult, just take lots of pictures during disassembly. Fair prices, in stock and fast shipping - what more can one ask for? I ordered wrong part and was able to get assistance thru email which was very quick and informative responses and was able to get what I needed in the end no problems. Good Job and thanks. Easy to find correct parts. Everything was correct and came in a timely manor. Will buy all parts for my evinrude from them. I like their pricing and fast shipping. Great! Fast delivery! Great part breakdown. I have always got great service from your website. Easy to use. Got the right parts fast. Thank's. Problem fixed: Running poorly, not pumping water. Installed carb kit, fuel pump repair kit and complete water pump assembly. No problems. I was able to find just what I needed with minimal searching. Totally rebuilt the wiring harness. Rebuilt the water pump. Rebuilt and adjusted both carburetors. Replaced the stator and rectifier. Replaced the spark plugs.